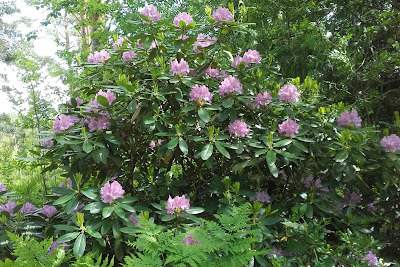 Our old and tested rhododendron is standing tall and in full bloom, this summer. This is a shrub that has lived the life of a nomad – first, due to lack of knowledge and later because circumstances change. I counted (on fingers and toes), that this shrub must be over twenty years old and as it's almost as tall as I am, I can't be far off with my calculations. It started its life at our place growing on the edge of a field, fighting off grass, sun and elks. This went on for far too long and finally we got wiser and moved it to the edge of the forest, where it belonged. Then an old tree fell next to our poor rhododendron and it ended up living in bright sunshine. The right kind of soil and nice neighbours was not enough for it and the shrub started wilting again. The third time that our, by now, quite tired looking bush moved, we got it right. It lives entwined with an old apple tree. It also got two younger cousins for company and the sun shines on them all early in the morning and late at night. All of this has led to it finally starting to thrive and as I said, bloom like it's never bloomed before. I have never been a huge fan of this particular family of shrubs. I find rhododendrons to be bulky and sad looking in the winter when they stand knee deep in snow. Still, we have cared for our friend and tried our best to keep it alive and happy as it was a gift and a fighter. My old flower bed has the same sentiment going for it. It's full of plants given to me as gifts. Seedlings given to me over the years, plants given to me because a friend felt I needed them and some old school perennials another friend felt belonged with us. I then added my own favorites into this mixture of plants and it all became a wild, colourful mess. Then the flowerbed was left to fend for itself for years and is now a jungle of perennials. This year I have started to take stock. I have moved some plants that struggled, added some more geraniums and I will still find some new flowers to fill up spaces that has been created by four lovely sheep. (I found them standing in the middle of the flowerbed, munching away, the other evening). Where there is some soil to be turned, the hens soon help out. This leads to flying plants, pecked leaves and some general fun time being had by all. Ebba the dog then gets into the swing of things and the result is yet another big hole dug somewhere where it was not really needed. Trees are easier. Trees are planted, they grow slowly, we forget they are there and life goes on. Then one fine day we realise that we have some beautiful trees growing in funny places on our yard, much too close to each other and already populated by birds, plants and creepy crawlies. That's when we also realise that the ship has sailed and we let them be, growing up to be stunning trees, all in funny places. This happens to us a lot and we have a bundle of fun watching all the birds that live next door to us in the summer. The hazel shrub we planted many moons ago is now as high as the oak trees it grows next to and the effect is stunning. Surprising but stunning. This garden design (ho, ho...) also allows the squirrels to move easily from hazelnuts to acorns without having to jump very far. It makes the collecting of food much safer too, as the bird of prey can't see the small busy bees hard at work. The actual bees also love the hazel for its pollen. The conclusion is, we are no garden snobs. We will never have a very symmetrical, designed garden or even a logical yard to look at. 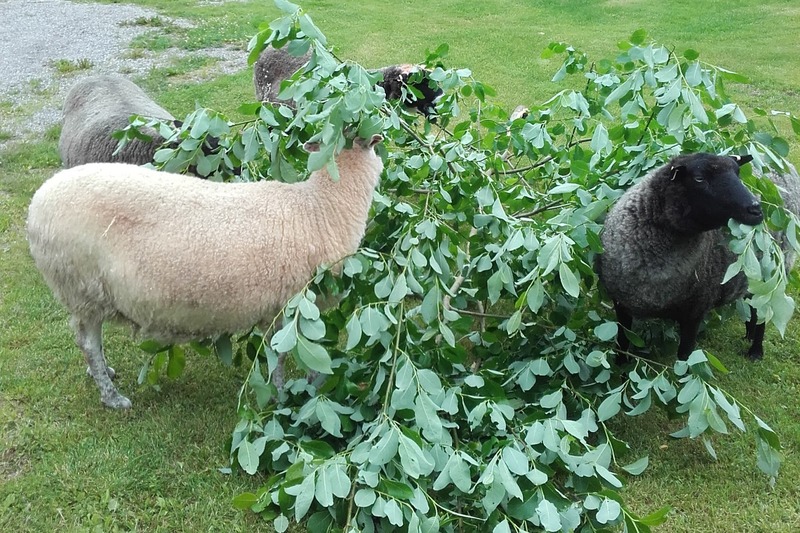 The plants get pruned and dug up by our lovely animals, trees are eaten by elks and deer and sometimes plants that finally get going die in the chilly winter. Sometimes a shrub that is far past its middle age just takes a deep breath and starts blossoming like never before, all because even after many mistakes, we got it right, for once. Stoneback Farm will now put its feet up, work like crazy anyway and call it our summer holiday. We will be back in touch on the Sunday the 23rd of July with more greetings from us all. Enjoy the summer and be well. "We are going on no summer holiday, all the worry stays a week or two....."
All the same, it's not minus 10 degrees cold and the sun is high in the sky so let's try and be happy. All the best from all of us.